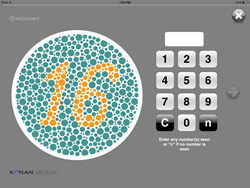 Military Grade Extended Color Vision Testing App for iPad is Now Available from iTunes® and the Apple® App Store. The iPad can now deliver professional grade color vision testing using Konan Medical's ColorDx app. Konan Medical (http://www.KonanMedical.com), a global leader in innovative diagnostic and examination devices for the ophthalmic industry today announced that it has released ColorDx Pro, a military-grade, extended color vision diagnostics app for iPad. ColorDx Pro is available from iTunes for an introductory price of $699.99 (USA Pricing). ColorDx is also available for Android™ tablets, Windows® and Mac® computers as well as online and print. More information and free 30-day trials are available from http://www.konanmedical.com/colordx .